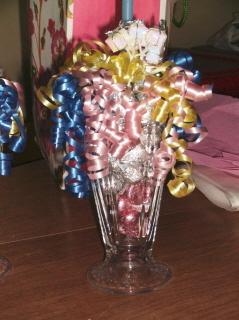 These bridal shower centerpieces turned out so cute. Start with an ice cream soda glass. Insert a colored straw. Add candies of your choice. I used hershey kisses. Some had pink wrappers, and some had silver. Layer the candy, till the glass is full. Use curly ribbon in the party colors. I tied them around the straw, curled them, and let them flow from the top. Use one or two, on each table. You could also make one for each guest as a favor.